Shawn Craik had very little teaching experience before finding Université Sainte-Anne. He taught a few undergraduate lectures as a graduate student at McGill, and as a PhD student, he had the opportunity to teach some undergraduate courses and labs. He decided then and there that he wanted to teach at a small undergraduate university, where he could commit to working with undergrads. Université Sainte-Anne has been the perfect place to meet those career goals. Shawn now teaches undergraduate courses in ecology, zoology and evolution at Sainte-Anne. He also supervises undergraduate and graduate students undertaking research in the field of ornithology. His students study a variety of topics from Northern Saw-whet Owl migration to brood parasitism in ducks. "As an ecologist, I try to take advantage of this wonderful nearby living laboratory by bringing my students into nature as much as possible. 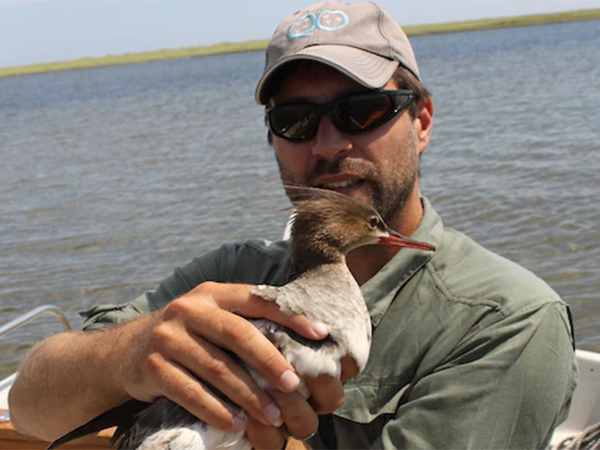 We band owls and ducks – with the proper permits of course – identify intertidal creatures, and study plant diversity as part of laboratory components of classes," Shawn says about the variety of habitats surrounding the Université Sainte-Anne campus. This includes Acadian forest, bog, the intertidal zone and ponds. The small class sizes at Université Sainte-Anne consist of around 15 students, which allows Shawn to take the time to open up topics for discussion within the group. "I try to be as dynamic as possible. This is something that's a bit more difficult to do with larger class sizes. I love asking students questions in the classroom and learning from what they have to say," he adds about his teaching style. Shawn tends to bring interesting props to further classroom learning. He says his students can expect the unexpected when it comes to his class; he brings in bird nests, fish, plants, feathers and more. Shawn's mode of teaching instills a passion for ecology in his students. He's proud to see them move on to graduate work or careers in this field. "Knowing that I had some sort of an impact in their career choice is extremely humbling. It is one of the best things that my job allows me to do," he speaks to the most rewarding part of his job as a professor. Many students may enroll in the sciences to become a doctor, dentist or physiotherapist, but Shawn says studies in the sciences are about a lot more than those paths. "At a much more fundamental level, they inspire curiosity and attitude of discovery, and they foster a desire for truth-seeking," he says. Shawn adds that if your dream is within any of these professions, or as a farmer, or even as an inventor, you should think about pursuing the sciences. If you are the type of person who is intrigued by experiments, are an observer of the great outdoors, or are an avid visitor of sites like www.nationalgeographic.com and www.sciencenewsforkids.org, then the sciences may be in your future.